A lovely day over the western Dales, with plenty of hot sun and those big drifting white clouds that herald a beautiful afternoon. ‘And going to get even better,’ prophesied the lady walking her terrier through Barbon village. 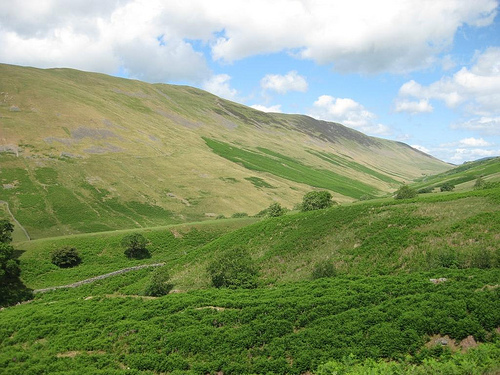 The green bulk of Barbon Low Fell stood on the eastern skyline like an invitation, and I couldn’t resist its summons. The woods of pine, beech and chestnut above Barbon Beck were drowsy with insect hum and shimmer. Speckled wood butterflies opened their cream and brown wings on warm stones, hoverflies hung suspended as if on invisible wires, and the beech leaves cradled flies in gorgeous glossy jackets of enamelled green. Leaving the trees, I looked ahead up the remote high-sided cleft of Barbondale, one of the least walked and loneliest dales. Its green flanks rose to open moor tops shot with cloud shadows under the blue and white sky. Giant convulsions of the earth’s crust hundreds of millions of year ago ripped the Great Pennine Fault through here, shoving Lake District gritstones on the west of Barbondale 8,000 feet into the air, while pushing the east side limestones up on end. Hence the steep west side of Barbondale, and the more weathered, rounded and ragged limestone tops to the east of the dale where I was headed. At Blindbeck Bridge a couple of young girls were playing in the beck. The smell of their picnic fire, thick and sweet, drifted across the stream. 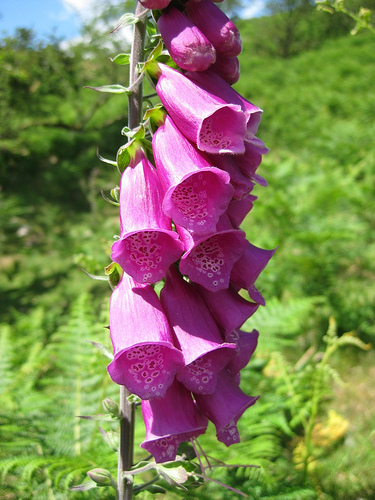 The scent of the fire and the girls’ shouts and laughter followed me along the sedgy old bridleway up the fellside to Bullpot Farm. The limestone hereabouts has been eaten by rain, frost and floods into thousands of holes, cave and underground passages, some with witchy reputations. Did a bull fall down one of the potholes near Bullpot Farm, drawn there by a maleficent hag? 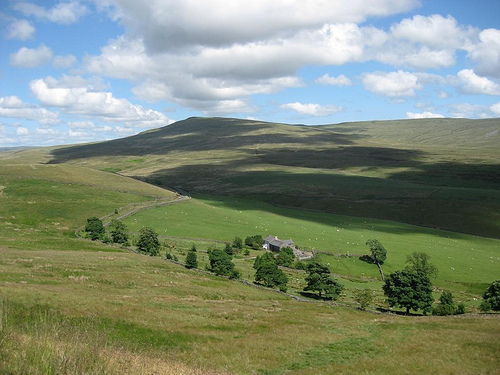 From the solid old house, tucked down in its cleft among shelter trees, I followed a moor road edged with bilberry and heath bedstraw, then a grassy fellside track that wound up and over the shoulder of Brownthwaite to a jaw-dropper of a view. 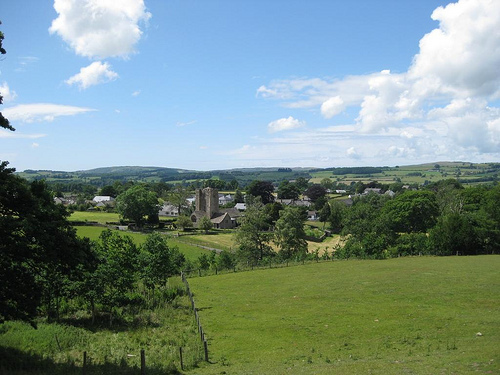 From this high point you look west over the tight grey huddle of Kirkby Lonsdale, out to the sea in Morecambe Bay, round to the fells of southern Lakeland, more sharply cut and mountainous than anything the Dales can show. The view owns grandeur, vast scale and intimate rural detail in one sweep. Incredible that anyone could be crass enough to site a windfarm here. But that’s the plan. If built, the Longfield Tarn development will insert a clutch of white, whirling, 350-ft-high turbines smack in the middle of this perfect prospect. 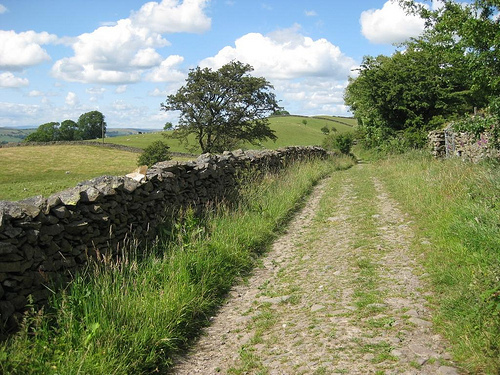 The rough cobbled lane of Fellfoot Road carried me most of the way back to Barbon. I could have taken a short cut across the meadows. But the afternoon felt timeless; a walk to spin out as long as I wished. Walk (8 miles, moderate, OS Explorer OL2): From Barbon Inn, right up road. Beyond Barbon Church, left (fingerpost) to cross Barbon Beck (631825); follow roadway round right bend and on. In ¼ mile on left bend, keep ahead (635826, blue arrow) through gate. Follow bridleway to Blindbeck Bridge. Right along road (656828); cross bridge; in 50 yards, left (654826, ‘Bullpot’); follow bridleway 1 mile uphill to road at Bullpot Farm (662815). Right for ½ mile. Above Gale Garth, right (657809, fingerpost, yellow arrow/YA) up green moor track for 1¾ miles by Brownthwaite Pike to road (641793). Right; at foot of steep slope, opposite ‘Wandales Lane’ fingerpost, right (635794) along stony Fellfoot Road for 1¼ miles to road (634810). 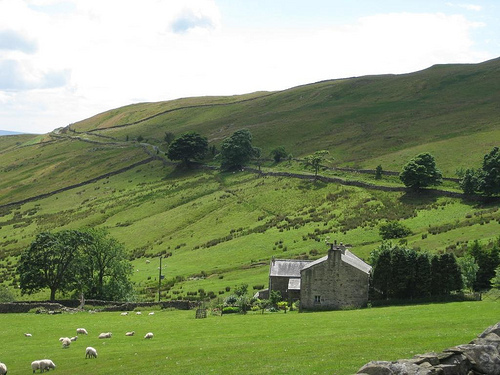 Left; opposite Fell Garth, right through gate (632646, ‘Barbon’). Cross fields through gates (YAs); cross Whelprigg drive (632812); aim for far left corner of big parkland meadow; through gate (632817); follow track (YA) through gate into Low Bank House farmyard (631818). Before buildings, right through squeeze stile; aim for far left corner of field; through stiles to road (639819). Right for 150 yards; through Underfell driveway gate (631821); through 2 more gates (YAs) into lane (631822). Left; in 30 yards, right over stile; cross field back to Barbon. 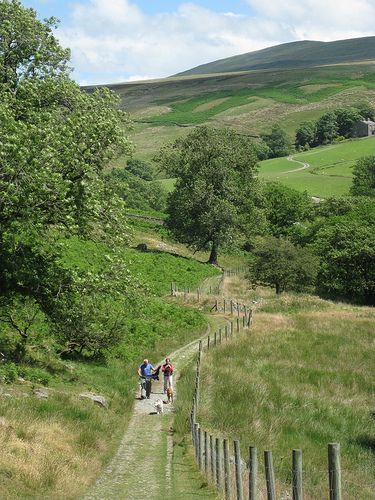 Enjoyed your walk in Barbon and Brownthwaite, Cumbria which we did yesterday 31 July. We were intrigued by the stones along Fellfoot Road and wonder if you have any information about them. I have searched to no avail. There were 10 stones or boulders along the road, on both sides, each enclosed by a stone wall about 3-4 metres square with a stile to access from the lane.